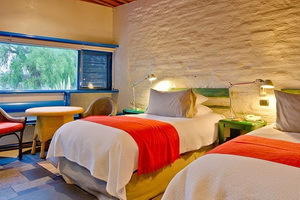 Explora Atacama Hotel was designed as the perfect base from where to explore the desert, the Andes highlands and many surrounding natural areas. Through more than 40 explorations that can be completed hiking, by bike, by van, horseback riding or in our observatory, you’ll be able to discover the deepest mysteries of the desert: its contrasts, geography, the sky, wildlife and culture. 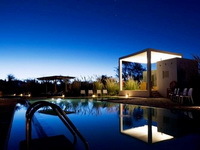 The Package at the Explora Atacama Hotel, based at Hotel de Larache in the oasis of San Pedro, puts visitors in the middle of a fantasy where exploration, the leaving and returning, acquires a shape of its own. The altiplano is more a metaphor than a geographical entity. More than a physical exploration, the trip through the altiplano is a spiritual exploration inside oneself in a unearthly world. The altiplano shows that behind the complexity of life there exists a simplicity that leads us to reconsider our place within the grand scheme of things. And that is what makes the trip to Atacama one of the most magnificent experiences that one can ever realize. 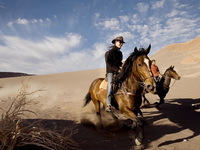 Our program, explora en Atacama, is an entire experience including our guided explorations, our gourmet food and what is most important, those unique moments shared with our staff and the local people. At Explora, we believe that the Hotel is only a base to regain energy and start fresh the following day. Despite that, our Hotel is a truly enjoyable place! At the Hotel de Larache, our 12 luxury rooms, each 33 m2 (355 sq ft), include Jacuzzi and a comfortable sitting area. They have Cordillera de la Sal view. Every room has unique wood on the ceiling and tile accents on the floor, fabulous linens and custom-designed furniture. At the Hotel de Larache, our 34 Yali luxury rooms, each 33 m2 (355 sq ft), include Jacuzzi and a comfortable sitting area. They have Orchard view. Every room has unique wood on the ceiling and tile accents on the floor, fabulous linens and custom-designed furniture. � All meals whether served at the hotel�s dining room, bar, terraces facing Licancabur volcano�. and of course all picnics and buffets offered during our explorations. � Open Bar. Including alcoholic drinks and a wide selection of wines. 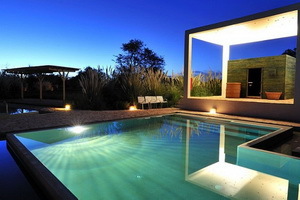 � Four connected outdoor pools and saunas. � Access to sala de exploradores (explorers� room) equipped with maps and books to better understand our explorations. � Private stables including nearly twenty-five horses, gaiters and helmets. � Mountain bikes and helmets. � One locker for every room at the entrance of the hotel. � Meeting room for 70 persons. Daily explorations, with bilingual guides. Per person, expressed in US dollars. US dollar rates are exempt from taxes according to D.L. 825 art. 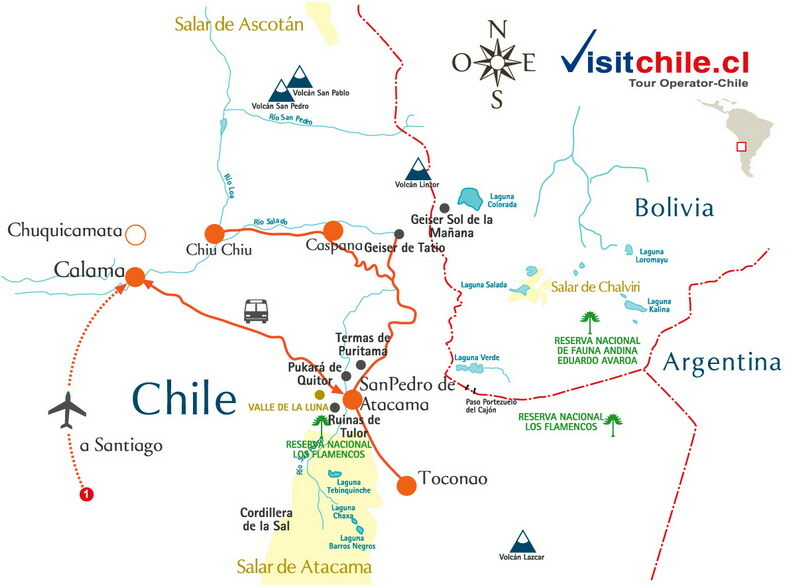 12 for foreign visitors who are not residents of Chile and who pay with US dollars. explora reserves the right to change or eliminate any part of a trip itinerary without warning when conditions could affect the health and safety of our guests. 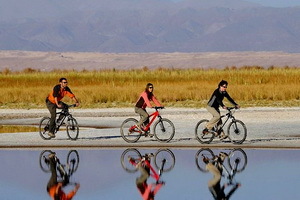 At explora Atacama we offer over 50 different explorations. On foot or horseback or by bicycle; a couple of hours to a full day; gentle or more physically demanding. 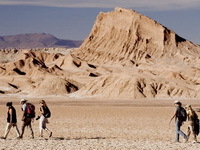 Our series of explorations will enable you to discover the ancient culture of Atacama, its singular wildlife, and get to know in-depth the natural landscapes of this vast terrain: from the brown of the Andean mountains and volcanos, to the white of the salt flats and the green of the oases.San Pedro de Atacama is located at an altitude of 2,500 meters (8,200 feet) above sea level. Our explorations, planned to enable your body to gradually become accustomed to the altitude, can take you to heights of between 4,000 meters (13,123 feet) and 4,500 meters (14,763 feet) above sea level and if you wish, even further on our high-mountain climbs. Explorations are safe and are made up of groups with a maximum of 8 people, accompanied by an expert bilingual guide. All our guides speak excellent Spanish and English and some also speak French and German.More extensive explorations include open-air picnics. Every evening, one of our guides will meet with you in the lodge bar to tell you about the explorations planned for the following day and help you with the difficult task of choosing between the 7 to 14 different options, all of them exciting.Our guides have substantial knowledge of the area and all have Wilderness First Responder (WFR) certification, which guarantees that they have the expertise and skills necessary to provide assistance to people in remote places.